"I'm a free person in a free country. The same is true for Kolomoyskyy, by the way." Prosecutor-General Yuriy Lutsenko has said that he met businessman Ihor Kolomoyskyy in Amsterdam, where he came for medical help, by chance. "I went to Amsterdam for a medical consultation. After the prison, every year I undergo a small surgery. 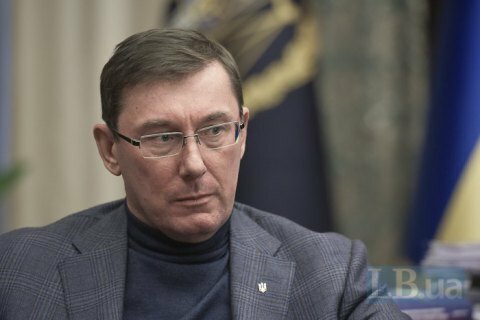 Excuse me, but I have the right to receive medical care where doctors who consult me deem it necessary," Lutsenko said in an interview with LB.ua. According to him, while he ran into Kolomoyskyy by chance, it was not the case with the person who photographed them together. "I know where he works and what rank he has. So what? But I'm glad that I was guarded even abroad. Listen, I'm a free man in a free country. The same is currently true for Kolomoyskyy too, by the way. He has not been indicted. However, I do not rule out that he can be, there is an unbiased investigation. If you ask me what we were talking about, then [I'll tell you] that I'm sensible enough not to discuss Privat [Privatbank, previously owned by Kolomoyskyy] with Kolomoyskyy," Lutsenko said. "I was glad to be able to tell him that it was stupid to provide media and financial support for those who undermine the foundations of the state. Ihor Valeriyovych heard me. We were talking about the campaign of Saakashvili and his entourage... You know, Kolomoyskyy is smart and does not require any proof. I spoke with him as a tourist in Amsterdam," Lutsenko added. Answering the question whether he had any evidence that Kolomoyskyy had financed Saakashvili's rallies, Lutsenko made a point that it was not up to him. "In fact, Kolomoyskyy can finance any political party, any political movement. It does not contradict the law. Therefore, I'm not going to monitor this. It's his right. Especially on the TV [channel] he owns. But as a citizen I think it's wrong in the current situation to put the stability of the country in jeopardy at a historically difficult moment," he concluded.